What does the term "donkstrike" mean? What is the definition of the term "donkstrike"? A "donkstrike" is when a "donkey" (aka fish) beats a superior (and more skilled) opponent in a hand. 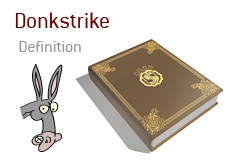 The most common usage of the term "donkstrike" occurs when said donkey comes from behind in a hand to beat the more skilled opponent, leading people to proclaim "Donkstrike!" A talented and skilled player raises from early position holding pocket Aces. A "donkey" is next to act in the hand, and looks down at J-Q offsuit. The "donkey" wants to get involved in the hand because he has two face cards, so he decides to make the call. Everyone else folds. The flop comes 8-10-2 rainbow. The experienced and skilled player fires out a bet, and the "donkey" decides to call. The turn brings another 2. Again - bet from the skilled player, call from the "donkey". The river brings the 9 of clubs, giving the "donkey" a straight. The "donkey" ends up taking down the hand, much to the chagrin of the player with the pocket Aces. makes this hand a definite "donkstrike".